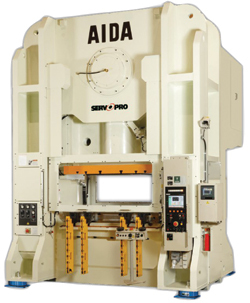 Aida-America Corp., Dayton, OH, has introdu ced a new servo-press version of its ULX-series precision stamping press, the ULX-D. It adds the firm’s direct-drive ServoPro technology to the ULX presses, which feature a rigid nine-point support system, zero-clearance slide gibs, and a no-connecting-rod design. This combination of features, the company says, has allowed manufacturers to shift from secondary machining processes to precision near-net-shape metalforming.